This blog post will look at the fundamentals of online partnerships, highlighting both their risks and their potential benefits to cross-promotion within the games industry. 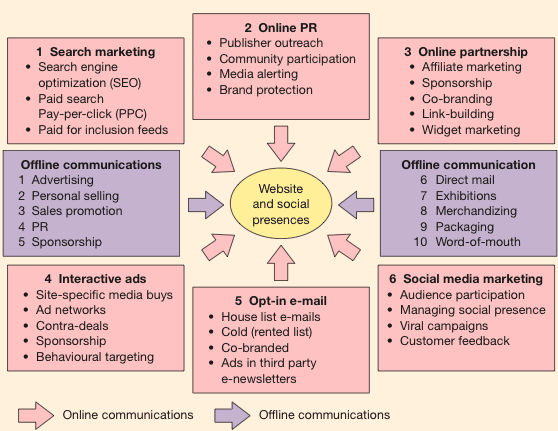 So just what is an Online Partnership? According to growth strategist Ryan Caliguri, these partnerships are about finding people or businesses who have influence over a market you wish to target, and working with them to introduce your business to their network. (Caliguiri, 2012). Cross-promotion is a form of promotion where a business will aim to target the customer base of related products through joint promotion (Belch and Belch, 2015). Through cross-promotion businesses are able to reach consumer bases across different mediums. the extent to which this is successful however can depend on both how the rigidity of the industry as well as how these cross-promotion activities are applied. Advantages of using cross-promotion in the gaming industry. Although yes multimillion-dollar deals such as the one between EA and Disney can be very lucrative there are forms of cross-promotion that appeal to both the large and small companies alike within the industry. Sponsorship deals can also be very lucrative when you have the right influencers on board many game company sponsor content creators on Youtube and Twitch. The content creators are able to reach the demographics that these games companies cant, so in return for paying them and offering other gifts, these content creators will influence their demographic to check out the company. To give you an example of how well this can work Youtuber Ali A recently hit 10 million subscribers, an avid gamer Ali A has had a number of sponsors of the year both internal and external of the gaming industry, companies will often give him products for free to give away to his subscribers. This does two things, firstly companies are able to great their products out there in front of a large audience but more importantly it’s in the hands of a person they can trust making them more willing to accept that product. In addition to this, it builds goodwill with both the audience and the influencer creating the potential for future promotional deals with that influencer. We can see examples of both widgets and Link building most often by simply visiting these companies websites. Here you’ll often find social media handles embedded on the site, easily accessible to any potential consumers. the same would be true for the companies social media page where they will likely have plugins for the main and subsidiary websites. Reputation takes time to build and seconds to break. Your own companies reputation is one of the highest stakes that the business must be willing to pay when entering a partnership with a third party. If your partner doesn’t hold themselves to the degree that you do risk being dragged through the mud along with them when things go wrong, having the potential to hurt your businesses profits, growth, and reputation with your audience. This is something that EA and Disney have been troubled with lately. Youtuber YongYea extensively covered EA’s recent turmoil with their fan base about Starwars battlefront 2’s controversial loot box system. 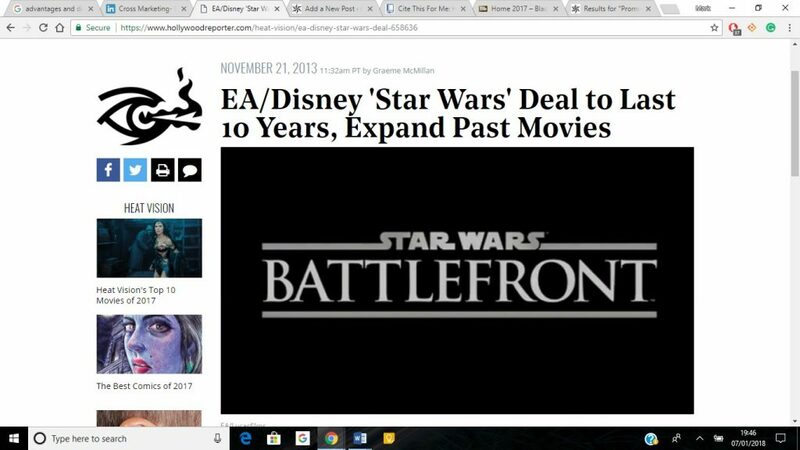 and with it being so close the release of a new major Starwars film Disney decided the couldn’t take the risk of having the negative press that EA was generating, making them pull the loot box system from the game indefinitely damaging their monetisation efforts. To conclude cross-promotion and partnerships in the game industry are likely to continue due being both cost-efficient and in some case highly lucrative. The key thing here is to find a company that works well with yours and hold their standards to the same degree or better than your own. You want to be working effectively with your partner not cleaning up after them. Belch, G. and Belch, M. (2015). Advertising and promotion. [Singapore]: McGraw-Hill Education. Caliguiri, R. (2012). Partnership marketing: a faster way to open new doors. The Globe and Mail. Enge, E., Spencer, S. and Stricchiola, J. (n.d.). The Art of SEO. Levens, M. (2011). Marketing defined, explained, applied + mymarketinglab. [Place of publication not identified]: Prentice Hall. Smart Insights. (2018). Digital marketing channels | Smart Insights. [online] Available at: https://www.smartinsights.com/reach/attachment/digital-marketing-channels/ [Accessed 7 Jan. 2018]. Smart Insights. (2018). Widget marketing | Smart Insights. [online] Available at: https://www.smartinsights.com/digital-marketing-platforms/widget-marketing/ [Accessed 7 Jan. 2018]. The Hollywood Reporter. (2018). EA/Disney ‘Star Wars’ Deal to Last 10 Years, Expand Past Movies. [online] Available at: https://www.hollywoodreporter.com/heat-vision/ea-disney-star-wars-deal-658636 [Accessed 7 Jan. 2018]. YouTube. (2018). Ali-A. [online] Available at: https://www.youtube.com/user/Matroix [Accessed 7 Jan. 2018]. YouTube. (2018). Disney is Not Happy with EA’s Handling of Star Wars Battlefront 2. [online] Available at: https://www.youtube.com/watch?v=Mus7u9K0PjY [Accessed 7 Jan. 2018]. Does the games industry handle its social media marketing effectively?